I hate Meadowhall. HATE IT. It's loud, busy, too hot and someone once stole my bags whilst I was in River Island. I've never forgiven the place. Therefore, I am never there for long enough to browse the food court (let alone stay for dinner, relax and enjoy it) as I usually do a mad-dash in and out to Primark/Levis/Victoria's Secret following my fail-safe route to quiet safety in under 45 minutes. 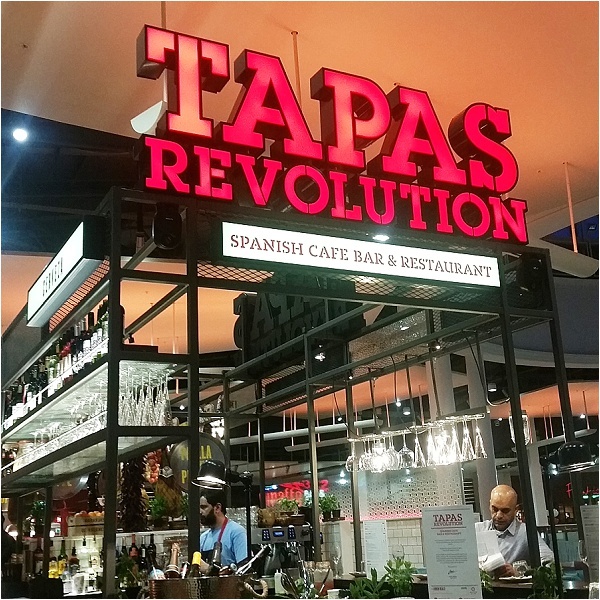 So when last week I was very kindly invited to dinner at the brand spanking new Tapas Revolution in Meadowhall's food court I was slightly reluctant. Did I want to schlep all the way out to my most hated shopping centre just for some small plates of nibbles? I didn't have a car that day. That would mean Public Transport. - He grew up in Spain. Home of Tapas. If anyone could review it, we could. - We were going on holiday the next day, why not start the relaxation a day early? - He just got a brand new job offer and wanted to celebrate. Well... all right then. But no Shopping. I arrived a little (a lot) early to our new eatery in my avoidance of any shopping and was immediately made welcome with a resounding chorus of 'Hola!' from their mostly Spanish team, took a seat at the bar with a beer and awaited the Boy. I was immediately taken with the decor, which is apparently brought in from Spain and gives the place a very authentic, 'outdoors-in' vibe. The Boy turned up, greeted everyone in Spanish like long lost friends, and we were shown to a little booth. 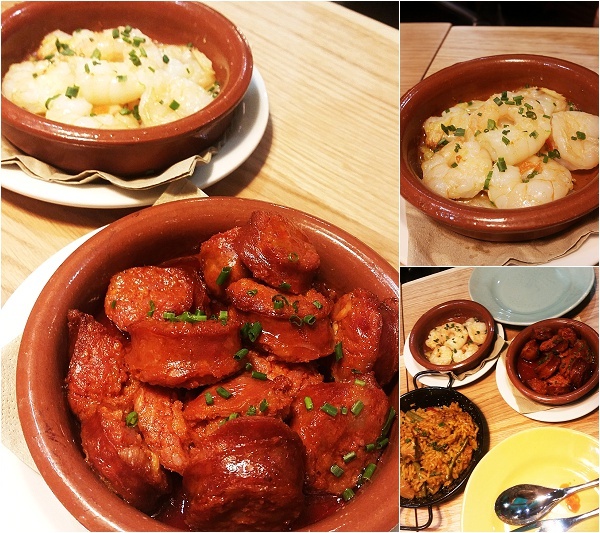 We ordered a small selection from the standard Tapas Menu - chorizo, calamares, boqorones, paella, gambas and manchego cheese. I quite like tapas due to the fact that I like to pick and nibble at multiple things, but I can't tell you what makes GOOD tapas. Luckily, the Boy does, and he was impressed. 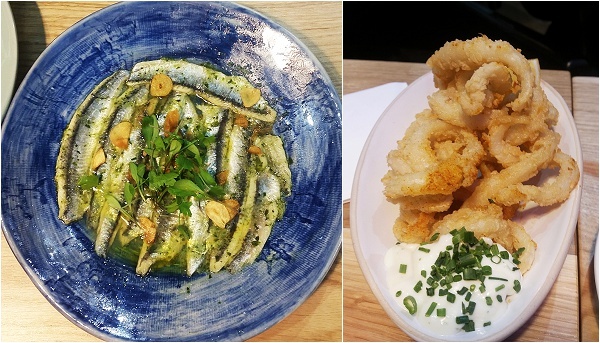 I'm not sure whether it was the fact that somewhere in Meadowhall can do Tapas well or that I had plied him with enough beer and wine and the promise that I'd drive home. Either way, we have both been to some big chain tapas restaurants and would rather head to Meadowhall for Tapas Revolution any day of the week now. The prawns were deliciously salty, and the chorizo oozing with paprika oil just suited for dipping bread in. I was unsure about the whitebait to begin with (whole fish!) but the vinegar dressing was divine and I soon gobbled up my fair share. Finally the calamari with garlic dipping mayo is one of my favourites whilst the Boy enjoyed his cheese! Delightedly stuffed, holidays and new jobs toasted, we were happy to head off home for an early night before our early flight the next day, but we were encouraged to try the take-out Churreria for dessert. Cooked fresh in front of you, the Churros are presented in a cone of chocolate sauce, dusted in cinnamon and sugar. 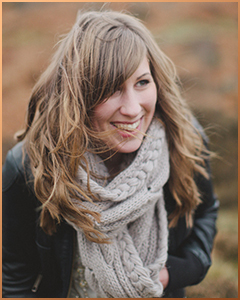 Perfect for wandering aimlessly to the car with, discussing the delicious food and hospitable staff. And then you notice you were so busy chatting whilst eating that you dripped chocolate down your new camel wool coat. Clearly there's still room for improvement, Meadowhall.